Why purchase a masonry heater for you home? The benefits begin with the aesthetics of a fireplace that is 80% plus efficiency in heating. The small volume of wood used in a heating season under 2000 sq. ft. home is about 2 1/2 cords. This is about half the cordwood of a conventional metal woodstove. Extraordinary durability and longevity results from the use of higher quality material and having no moving parts. There are many heaters in Russia that are over 200 years old and still in use today. The most important one of all is financial payback; how long to pay back my investment? I highly recommend retro fits into existing homes. Example: If you burn an average of 1000 gallons of oil in a heating season and you decide to install a masonry heater with an upfront cost of $16,000. That means you're spending $3,650 on heating your home with oil. (December 19, 2013 average heating oil in Maine is $3.65 per gallon). A safe estimate is that a masonry heater will save you an average of 500 gallons a year, which is an estimated savings of $1,825. If you factor buying two and a half cords at $175 per cord, you save $1388 per year with a payback of twelve years. If you're resourceful in cutting and splitting your own firewood your payback would be 8.5 years. And if you save 600 gallons of oil per year with your own firewood, payback is 7 years. Another savings comes from the reduction or elimination of chimney sweeping, (assuming you do not sweep your own). I have been burning my masonry heater for seven years and have never had to sweep my chimney. The reason is that with quality, well-seasoned wood, the masonry heater fires over the 950° F which is the threshold for burning all of the gases, and therefore creates a very clean combustion. At the start of every heating season I take a mirror and look up the chimney to make sure there is no obstructions, and we do recommend that the masonry heater itself be vacuumed once a year for fly ash that made it through the system. This is usually done with a shop vac and is a very simple task that you can perform yourself. If an average sweep is $125, and you have it swept once a year, that's a savings of $1250 over ten years. If you have your chimney swept twice a year (the recommendation by most professionals) you can save about $2500 over ten years, and that's if their rates don't go up over the years. Another resourceful way is that with a masonry heater you can now burn all of the wood most people consider inferior, such as softwood. Softwood burns well in a masonry heater. In today's economy this makes for a wise investment. One of my clients built a 1200 square foot home with R60 ceiling and R24 walls and he heats his home 100% with masonry heater using two cords for the entire heating system. I hear people say I would love to own a masonry heater but I want to move in five to ten years. Well my answer is that five years is a long time to wait. Fuel prices continue to rise. Every year your masonry heater is saving you money, and creating a wonderful environment for your family. In general, a masonry heater is fired once a day for a period of three hours. After the fire goes out you are absolutely done, nothing to worry about, 20,000 to 25,000 Btu's radiating per hour from heater with no tending or work. I have heard from folks with metal wood stoves that it's always in the back of their minds if their chimneys are in good enough shape. 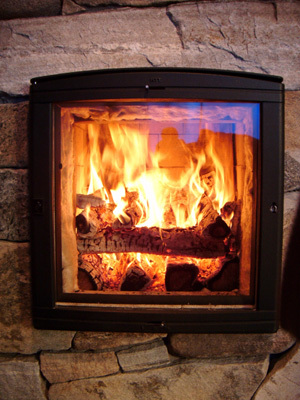 With a masonry heater, there is no more tending a wood stove 24 hours a day. With a masonry heater there is no fire, so you can sleep well knowing that the safety of your family is in good hands. If you're thinking of selling your home in five or ten years that's five to ten years of use. A masonry heater HOLDS its value. People buying homes will find that a very attractive reason for purchasing your home for the high efficiency and savings. I call that selling power. I spoke with Dana Fisher from Efficiency Maine and masonry heaters qualify under the pace loan. A fifteen year loan on $15,000 is $119 per month. So you build a masonry heater then you decide to move after six years. Well then the next home owner will be surely happy to take over payments and have the masonry heater in the home. Your home will also pay back the six years you paid in. As Dana said, a masonry heater will hold its value. Whether you're thinking of building a new home with a masonry heater as your primary heat, or retro fitting one into an existing home to reduce your home heating costs, the decision will bring you financial security, peace of mind through what time you have it. You don't have to be in the house for 30 years to incorporate a masonry heater. The benefits far outweigh waiting five or ten years for that radiant comfort and fireplace ambience you always wanted.